Sometimes I like to do extremely dorky things on the weekends, like play Dungeons and Dragons with the Anthropologist, a couple of people from the forensic anthropology department, and their partners. But this isn't the D&D you knew in junior high, with you and your friends sitting in the basement with a bag of chips and a box of soda. Three of the players (myself included) love to cook, so when we do potlucks, we are eating well. For this game, I made enchiladas suizas and a banana tarte tatin. I didn't take any photos at all because I was in a rush to get it all done before we had to leave, but I can tell you, they looked and tasted delicious. The enchiladas had flour tortillas wrapped around sliced Quorn cutlets, a tomatillo sauce, and Swiss cheese, topped with a white sauce and more cheese. The tarte tatin was like a puff pastry filled with bananas Foster. I like playing with these guys because I get to talk food with them. Cris, who made chicken marsala with sage, mushrooms, and red onions, recently mentioned wanting to get a pasta maker for her KitchenAid. When I expressed interest (and jealousy! ), she said I'd have to come over and make pasta with her. That's something I'm looking forward to — because I've always wanted to make pasta from scratch. She also recognized that my enchiladas were based on a recipe she'd also used from Cooking Light. I love bonding over food! Place the tomatillos and chiles in a saucepan, and cover with water. Bring to a boil, and cook for 8 minutes. Drain, reserving 1/2 cup water. In a food processor, puree tomatillos and chiles with cilantro and garlic, adding water to thin if necessary. In the same saucepan, sautee onions until fragrant, then add tomatillo puree. Simmer for ten minutes, until reduced to about 1 cup. Remove from heat, and stir in 1/4 cup sour cream. Put Quorn into a shallow dish, and microwave according to package instructions. When cool enough to handle, slice into thin strips. In another saucepan, combine milk and flour over medium heat, stirring constantly with a whisk. Cook until thickened. Remove from heat, and whisk in remaining 1/4 cup sour cream. Heat tortillas (in the microwave, in a dry pan, whatever). Spread 1/3 cup of tomatillo sauce on the bottom of a 9" x 13" pan. In each tortilla, place a few strips of Quorn, about two tablespoons of cheese, and a generous spoonful of tomatillo sauce. Roll up, and put into prepared pan. Top enchiladas with remaining tomatillo sauce (if any), the white sauce, and about 1 cup cheese. On a lightly floured surface, trim puff pastry to a 12" circle. Place on a baking sheet lined with parchment paper and refrigerate for 15 minutes. Cut three 1/2-inch slits in the middle, and set aside at room temperature. In an oven-proof skillet, melt butter over medium heat. Stir in brown sugar, cinnamon, and salt, and cook until amber, about 3 minutes. Place bananas in skillet, all lined up in the same direction, slightly overlapping (but don't worry if it's not perfect). Cook, without stirring, for 5 minutes. Sprinkle vanilla and rum over the top, and cook another 3 minutes. Place the puff pastry on top, trimming with kitchen scissors if neccesary. Let cool slightly, then place a serving plate on top of the pan. Invert the entire thing, then lift the pan off the plate. If the tarte sticks, turn the pan back over and run a small spatula underneath the bananas, and try again. Serve with creme fraîche, whipped or not. Both those recipes sound wonderful!!! And I've never played D&D, but it always sounds like so much fun! 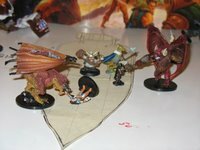 I miss D&D! We used to use it as an excuse to just snack - while my frinds love good food, I can't get most of them excited about potlucks where everyone actually makes something instead of buying a platter of veggies or something. I need to have a "gourmet/cook it yourself" party. Sher - D&D is great and completely addictive. So having lots of good food to eat when you're playing for hours is a must! Mike - Yes, that sounds like a good idea. "Potluck" should really mean "cook it yourself." What kind of frozen puff pastry do you use? I can't find one I actually like and tastes good and doesn't fall to pieces the moment I touch it--wet towels to keep it moist until I use it be damned. Hi, anonymous - I used the only brand I could find (interesting, considering I shop at three different places! ), which was Pepperidge Farm. I had no problems with it at all - and this was my first time using puff pastry.